NETWORK FINALS: Lots of sports meant lots of adjustments: ABC’s NBA game to 1.4, NBC’s NHL ALL-STAR GAME to 0.6, and FOX’s PREMIER BOXING to 0.5. 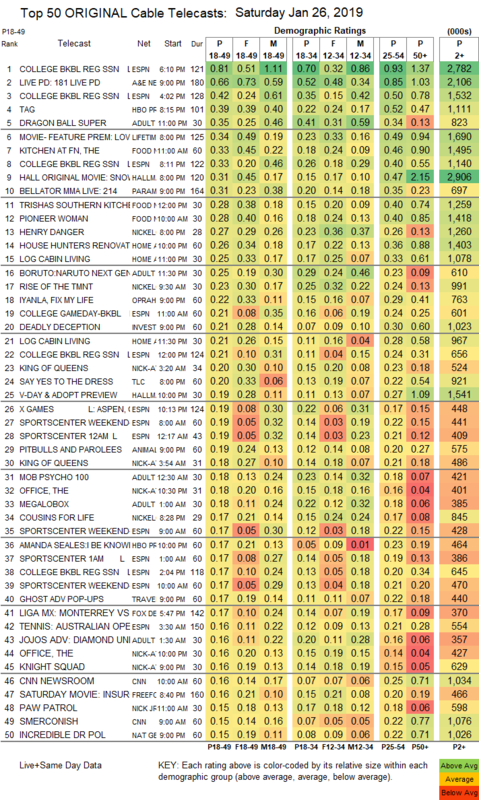 CABLE HIGHLIGHTS: ESPN’s COLLEGE BASKETBALL games were at 0.81 /0.42 /0.33/0.21. A&E’s LIVE PD slipped 0.03 to 0.66. Adult Swim’s line-up performed as follows: DRAGON BALL at 0.35 and 0.16/489K & 0.16/431K & 0.35 compared to last week’s 0.34 and 0.14/423K & 0.14/435K, BORUTO down 0.01 to 0.25, MY HERO ACADEMIA down 0.02 to 0.21/534K, MOB PSYCHO 100 down 0.04 to 0.18/421K, MEGALOBOX down 0.02 to 0.18/35K, JOJO’S BIZARRE ADVENTURE down 0.04 to 0.16, BLACK CLOVER down 0.02 to 0.16/333K, HUNTER X HUNTER down 0.04 to 0.15/333K, NARUTO down 0.04 to 0.14/354K, ATTACK ON TITAN down 0.04 to 0.09/235K, POP TEAM EPIC down 0.02 to 0.08/204K, and MOBILE SUIT GUNDAM down 0.01 to 0.09/196K. Lifetime’s original movie LOVE YOU TO DEATH was at 0.34. On Food Network, KITCHEN AT FN ticked up to 0.33, TRISHA’S SOUTHERN KITCHEN rose 0.05 to 0.28, and PIONEER WOMAN was down 0.04 to 0.28. Hallmark’s movie SNOWCOMING was at 0.31. Paramount’s BELLATOR was at 0.31. Nickelodeon’s primetime HENRY DANGER climbed 0.07 to 0.28, and its morning RISE OF TMNT was at 0.23. HGTV’s HOUSE HUNTERS RENOVATION dipped 0.03 to 0.26, and LOG CABIN LIVING was at 0.25/0.21. On OWN, IYANLA, FIX MY LIFE gained 0.05 to 0.22, and LOVE & MARRIAGE was at 0.12. ID’s DEADLY DECEPTION ticked up to 0.22. On TLC, SAY YES TO THE DRESS was steady at 0.20, and FOUR WEDDINGS held at 0.14. BBCAmerica’s DYNASTIES was down 0.02 to 0.11, and up 0.03 to 0.09 on AMC.